I thought I would take a few minutes to answer some questions we get asked frequently over email. This puzzle is so hard--is it even possible to solve? Yep :) There is a solution to every puzzle. Keep working on it! One trick I find useful when solving the puzzles is to start from the outside. Try to connect dots and fill paths which use the outside squares before connecting the inner ones. Also, if you're struggling with 8x8 level 13 rest assured that you aren't the only one. We get a lot of request for help on that one. If you want a hint, click here. Why do some completed levels show checks and some show stars? Whenever you complete a level you will receive either a check or a star. A star indicates that you completed the level perfectly without any mistakes. A check indicates that you completed the level but broke a path or two before finishing it. 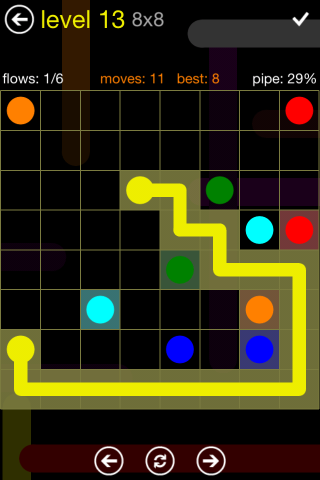 I am color blind and would like to play Flow. Is there an option available for me? Yes! Flow supports text labels. From the main menu, tap "Settings" then switch "Flow labels" from off to on. When you go back into the game, the color dots will now also include text labels. I purchased a level pack on my iPhone and want to get it on my iPad. Is this possible, will I be charged twice? Thanks for your support! You can download any purchased level packs onto all devices under the same iTunes account at no charge. The simplest way to do this is to go into Settings and click "Restore Purchases". You will see an Apple dialog appear and will need to type in your iTunes password. After that any level packs you previously purchased will be downloaded to the device. I've been playing for a while and the sounds stopped working. How do I fix this? We are looking into what causes this but usually the game just needs to be rebooted. To reboot the game, double press the home button, you'll see a set of icons on the bottom of the screen, tap and hold the Flow Free icon until the icon starts to wiggle, then press the close button in the top left corner of the icon. Hit the home button again and restart the game. If I play Flow on multiple devices, will my progress automatically sync between the two? Sorry, no. Right now progress is only kept locally so it will not sync between your devices. This is something we've seen come up a bit and it's definitely on our potential feature list. I'm trying to purchase a level pack but Flow keeps crashing, how do I fix this? Update 7/28/12 - This issue should be fixed in version 1.2. It was caused by a problem handling the case where in-app purchases were disabled. If you're still seeing a crash trying to make a purchase, let us know. We've seen this happening when in-app purchases are disabled. This is a bug and we expect to fix it in our next release so that Flow won't crash in this scenario but you'll still need to enable purchases before you can buy a level pack. To turn on in-app purchases, go to Settings --> General --> Restrictions, at this point you'll need to enter your pin. On the Restrictions options, one of the options under Allowed Content will be in-app purchases. If you're seeing a crash when trying to make a purchase and you don't have in-app purchases disabled, please let us know either via a comment here or via email as we would like to track down if there are any other issues in this scenario. When are more packs coming out? Update 7/28/12 - Version 1.2 is now availble and includes 4 new packs (2 free, 2 for purchase.) Hope you enjoy it. We're still looking at other content to add in future updates but no comments on that right now. Leave a comment or shoot us an email if you have another question. I'll update this post if I get anything that seems interesting.